Thailand Phi Phi Resort offer a glimpse of paradise. For the many travellers who make their way out to the islands on the Thai south west coast the beachfront resorts are the reason why they come to Thailand in the first place. The stunning scenery and beautiful beaches, what more could you want? Thailand's Phi Phi Resorts offers a lot more than stunning scenery and beaches and often gets voted in as one of the top island destinations in the world. Recently Co Phi Phi (they called it Co Phi Phi rather than Koh Phi Phi), was awarded 'the happiest people to live in' by the WIN-Gallup International center survey. Thailand is a smiling nation and it is considered good manners to always show a happy demeanour so it is no surprise that Thailand Phi Phi Resorts are highly popular. The island has a very mixed accommodation that caters to all budgets, from backpackers to those who enjoy the lap of luxury. This gives the island a very eclectic feel and the bars at night, reflects this very varied scene. I suppose the reason why everybody mixes so well is because there is a very informal dress code, Phi Phi Island is a place where beach shoes and shorts can do you for the whole day! Most of the luxury resorts are in the quieter north of the island at Laem Tong Beach and Loh Bagao and include Zeavola Phi Phi Resort, Holiday Inn Phi Phi Island and Phi Phi Island Village Resort And Spa. The famous 4 star Phi Phi Island Cabana Hotel is right next to Phi Ph Don Village. The beach front rooms, villas here hold a magic that is rarely surpassed in Thailand. Inexpensive and cheap budget accommodation can be found mainly around the Phi Phi Don Village. Here the guesthouses and simple 1 and 2 star family run accommodation mix seamlessly with the 3 star pool and beachfront resorts. Phi Phi isn't the cheapest accommodation in the region (probably Koh Lanta gets that star) but what you do get is an overwhelming emotion of beach, coral reef and sun, a village full of people just wanting to have fun and of course, world class scenery. Some travellers are looking for a bargain and this can be done by studiously looking at the form book. Low season has a tremendous advantage over the high season as rates are often 50% cheaper. The other point is that from May to October, this is when the resorts give free night stays away in a stay 7 night pay 5 night format. And finally phi-phi.com gives a Long Stay Deal throughout the year for all the resort on the island. Phi Phi Resort reviews come in many shades from excellent to terrible so it really is worth checking out each hotel's reviews. 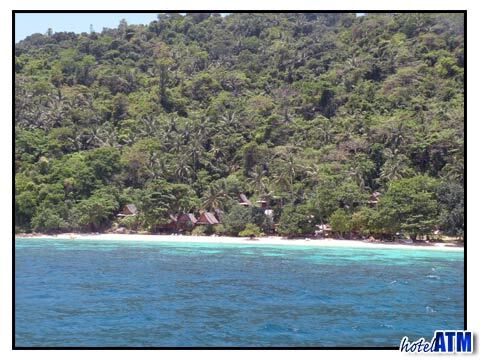 phi-phi.com has a review page on each of it's 50+ hotels online see an example here; Phi Phi Relax Beach Resort. The parent website hotelatm and phi-phi.com offers a host differing deals for the savvy traveller including Free Night Specials, Fixed Night promotions, Special discounts, Early Bird Offers, Honeymoon deals, and Long stay Deals. They alter during the different seasons but can be found for PhiPhi Resorts here.